The University Center after-school academy is hosting two after-school sessions that meet on Mondays and Thursdays in the spring semester. University Center LEGO Robotics after school sessions are 12 weeks beginning Feb. 11 for the Monday session. The Thursday session begins Jan 31. Times: Both sections are held from 4 to 5:30 p.m. Questions? : Contact the UC – (580) – 718 – 5600, or [email protected]The UC is hosting two separate after-school programs this spring semester. Each after-school program will be guided by the certified UC LEGO robotics instructor. The sessions will both meet 12 times over the semester. 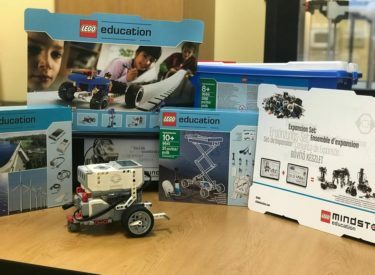 Each student will have access to the full array of LEGO’s EV3 kits and every additional expansion set of the LEGO company. There are only 12 spots per session available. Each student will have to work with their own ROBOT to assemble, program, and demonstrate with the class. Students will have the opportunity to creatively build, explore, and program their robots to achieve a number of challenging problems. These problems will be tackled individually and collaboratively. A number of different expansion sets will be made available, including simple and powered machines, renewable energy sets, pneumatics and hydraulics, and automation principles. These will be explored by students in this self-paced exploratory environment. Students will also showcase their prototypes at the conclusion of the spring semester. Feb. 4, 11, and 25. March 4, 11 and 25. April 1, 8, 15, 22 and 29. March 7, 14 and 28. April 4, 11, 18 and 25.